Lara Alcazar is the leader and activist of FEMEN Spain. With just 21 years old, she decided to create the headquarters of the feminist group in Spanish territory. After contacting with the known activist from Ukraine, Inna Shevchenko, she formed the organization in May 2013. Under her leadership, FEMEN Spain has already been featured in several public protests with great impact on the media. Currently FEMEN Spain is disagree with the Gag Law which was approved last month in Congress of Deputies. 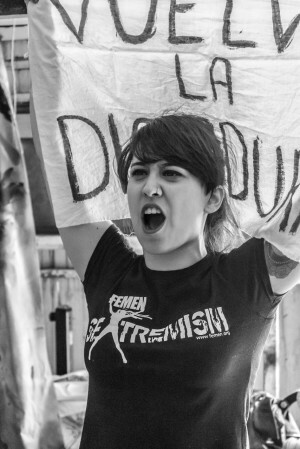 Lara Alcázar forth in a letter the reasons about why FEMEN is fighting against this law. The principal reason is because they consider that this law is focused on blocking a basic human right: the right to protest. In December 2014 the new Citizen Security Law suggested by Partido Popular, a current political party in the Spanish government, was approved in the Congress of Deputies. The law was approved although only Partido Popular was in favor of it. The rest of the parliamentarian groups showed their opposition by voting against it. The unilateralism that characterizes the proposal and approval of this law is an example of the Spanish government’s intention to shut up any kind of dissent against their policy of economic and democratic austerity. The majority of cuts that have taken place in Spain are concerning human rights and the access to economic resources, benefits or services that the state has to guarantee to and provide for the citizens. Services and rights such as public education, healthcare, sexual and reproductive rights. Or, as in this case, basic political and judicial democratic rights. The Citizen Security Law is in fact a modern review of the Franco Public Order Law, which established the felonies to defend the basic pillars of Franco’s dictatorial totalitarian regime. “Crimes” like rebellion, public disorders (the right to protest and the right of free expression) and illegal propaganda (any kind of meeting, gathering or expression of different ideas opposing the Franco regime). The Court of Public Order of Madrid, which initially called “Special Court for the Suppression of Freemasonry and Communism”, worked from 1963 until 1977. This Gag Law is a legislation to benefit the government and proves a preventive measure before and during the upcoming political elections, where a growing number of demonstrations and protests are increasingly in favor of a change of government. Their first priority is to silence all kind of activities that are part of the civil rights. The reform of the penal code will toughen regarding the offenses previously considered as mild, raising them to serious or very serious offenses, and discarding many minor faults considered as such to become a crime. This law is unconstitutional because it puts in danger many basic rights of a democratic system, like the right of assembly, the right to protest and free expression and also the right to belong to a political group. The Gag Law will legalise and increase the creation of ideological records of political activists and it will give the police, who is already sufficiently protected by the state, even more power. The police has enough power and that’s exactly why their crimes, their faults, their attacks or possible tortures are not reported by activists and citizens because their testimony is immediately overlooked by judges and public prosecutors. A disproportionate enlargement of the idea of public order is put into action and allows the repression of people’s movements and civil protests implying a police actuation similar to authoritarian regimes. This kind of police intervention acts directly against individual freedom. The sphere of this police activity increases on supposed administrative infractions that create more fear in an already terrified society. Penalties are generated by the administrative apparatus through the reduction of economic power and therefore represent a totalitarian capitalist mechanism that covers up the traditional dictatorial image to the one we are used to. Administrative penalty vents to judicial power, reverts in the sanctioning governmental system and the trials are lower. The judicial expense for the citizens decreases, there is less chaos, and thus the citizens are deprived of the right to be judged democratically. Here are examples to understand the measures that this law proposes to remove “activist threat”: Protesting inside infrastructures will cost penalties of up to € 60.000 euros, refusing to be identified by the police €30.000, protesting without permission, protesting in front of the the Spanish Congress or in front of any official organization, trying to avoid an eviction, resisting to be arrested or occupying a bank will also be a reason to get an economic penalty of this caliber. To oppose these penalties, we would have to resort through administrative and judicial procedures, and this implies administrative legal fees, which the previous Minister of Justice, Alberto Ruiz Gallardon, had already increased. However, it is not surprising that the precursor of this law has been Jorge Fernández, the current Minister of the Interior, who is known for his proximity with the catholic sectors and his family relations with the Franco regime. Already in 2012 on a conference in Barcelona Fernandez Dias hinted at his ideas about the restriction of the rights to protest with an intervention called “Urban Violence: intolerance as an expression”. In his speech he described the union pickets as not civil. He also claimed that the system had to eliminate the presence of anti-system people who are taking advantage of the system through more effective and repressive actions. Maybe this was his inspiration for proposing the Gag Law, which is now pending in the Spanish Senate. Spain: Congress Passes Draconian “Gag Law”! Do you think the protestors will stop protesting because of the new restrictions?